She became a popular character artiste portraying supporting roles and also acted in TV shows. Shammi starred in films like Coolie No. 1, Ustad Pedro, Bhai- Bahen, Dil Apna Aur Preet Parayi, Half Ticket, Jab Jab Phool Khile and Ittefaq. She also appeared in many popular television serials such as Dekh Bhai Dekh, Zabaan Sambhal Ke, Shriman Shrimati, Kabhi Yeh Kabhi Woh and Filmi Chakkar. 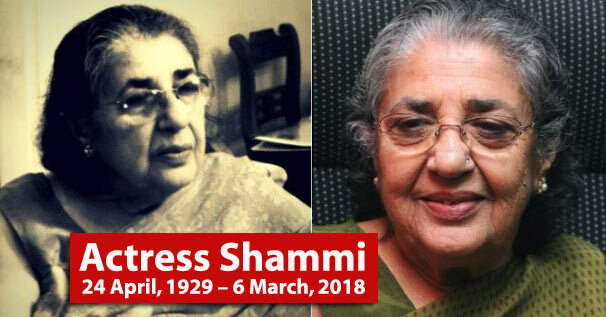 Shammi (24 April, 1929 – 6 March, 2018) born Nargis Rabadi was an Indian film actress who appeared in over two hundred Hindi films. Shammi remained a sought-after with filmmakers when it came to goofy and comic roles, especially in the period 1949–1969 and later from 1980–2002. Her famous films as supporting actress included Dil Apna Aur Preet Parai, Half Ticket, Halaku, Samaj Ko Badal Dalo,Khuda Gawah, Coolie No. 1, Gopi Kishan and Hum Saath Saath Hain and films with Rajesh Khanna like The Train, Aanchal, Kudrat, Red Rose (film), Awara Baap and Swarg. She had been a leading actress playing main female lead or second female lead in Hindi films between 1949–1955 as well. Later, from 1986 till 1998, she appeared in many popular television serials such as Dekh Bhai Dekh, Zabaan Sambhal Ke, Shriman Shrimati, Kabhi Yeh Kabhi Woh and Filmi Chakkar. Shammi was married to film producer director Sultan Ahmed for seven years, before they were divorced. Shammi is the younger sister of fashion designer Mani Rabadi.